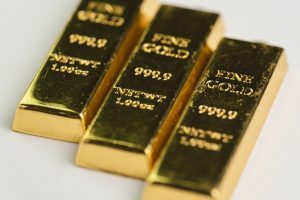 Gold futures settled slightly lower Monday and for the year, but bullion capped a tumultuous year with gains in December and for the quarter, as stock-market volatility has driven haven-related demand. February gold futures GCG9, +0.11% closed down $1.70, or 0.1%, at $1,281.30 an ounce. Gold futures, as measured by the most-active contract, notched a roughly 2% drop for 2018, but ended up 4.6% in December and 7.2% over the last three months of the year, according to FactSet data. By contrast on the day, March silver SIH9, +0.67% gained about 10 cents, or 0.6%, to $15.54 an ounce. Silver is down 9.4% year to date and has gained 9.4% in December and locked in a quarterly gain of 5.7%. Moves for gold on Monday came even as stock indexes, which often trade inversely to precious metals, climbed after President Donald Trump on Saturday tweeted that he and Chinese President Xi Jinping had made “big progress” in a telephone discussion about trade, though sources close to the talks told The Wall Street Journal that Trump was possibly exaggerating progress in a bid to calm markets. “Looking at the equity markets, one can clearly see that there is positive optimism around [trade talks], however, gold traders aren’t willing to pay too much attention to this. Perhaps, they don’t believe that the progress made so far is good enough,” said Naeem Aslam, chief market analyst at Think Markets UK, in a note. Stocks are ending a down year on a high note, with the Nasdaq Composite index COMP, +0.77% in bear-market territory and the S&P 500 index SPX, +0.85% and Dow Jones Industrial Average DJIA, +1.15% on track for monthly and annual losses that will mark their biggest decline since 2008. Equity weakness, along with heightened volatility, has been credited with stoking demand for gold and other traditional haven assets, while a weaker dollar is also seen providing a lift. The ICE U.S. Dollar Index DXY, -0.27% a measure of the U.S. unit against a basket of six major rivals, is up 4.5% in the year to date but has retreated more than 1% in December. On Monday, it was off 0.2%, offering a runway for gold and other precious metals to climb because dollar-pegged assets tend to move in the opposite direction to bucks. Meanwhile, palladium was set to end a blockbuster year on a positive note, with the March contract PAH9, +1.23% up $13.80, or 1.2%, to settle at $1,197.20 an ounce. Palladium booked a rise of nearly 13% in 2018 after hitting a string of all-time highs, boosted by demand from auto makers. In other metals trade, April platinum PLJ9, +0.49% rose $4.20 cents, or 0.5%, to end at $800.60 an ounce, on track for a 15% 2018 gain. March copper HGH9, -1.53% fell by about half a cent, or 1.9%, at $2.6310 a pound and notched a 2018 drop of nearly 20%.